Courage Under Fire is put together like the pieces of a puzzle. Had it been a great puzzle, a mind bender of spectacular resonance, the movie might have been an order of magnitude better. As it stands, the drama is somewhat diffused by the deliberate cross-cutting between the action under investigation and the investigation itself. Edward Zwick is a fine director who consistently displays a sense of pace and an eye for the dramatic scene. Zwick’s war scenes, whether from the magnificent Glory or the overblown Legends of the Fall, are dynamic and exciting. Zwick uses the medium to its fullest, combining the power of his images with nerve crackling sound. Denzel Washington is always a fascinating actor to watch. The man lights of the screen with movie star presence, but the role of Lt. Colonel Serling is far from charismatic. The Washington casting provides a history for the character that might otherwise be non-existent. Such is the value of a star presence. While the Colonel is in many ways a weak character, we understand the star will overcome the shortcomings built into the character by the script. It’s a valuable element in making movies and that’s why there are stars and other celestial beings plying the acting trade. The style of Courage Under Fire is reminiscent of Rashomon, the classic Kurosawa film, in which events are retold differently by various witnesses to an incident. Serling, wrestling with his own misgivings about a Gulf War decision to open fire mistakenly on friendly armor, is given the task of investigating the Congressional Medal of Honor nomination for Captain Karen Walden, killed in action during a different Gulf War engagement. Gradually, through the process of investigation, Serling comes to terms with his own conduct. The script by Patrick Sheane Duncan breaks no new ground and some of the characters are somewhat clichéd. 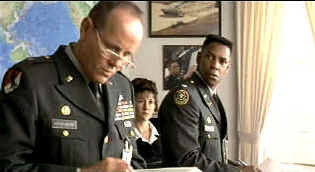 Under Zwick’s hand, Courage Under Fire is a powerful film that develops beyond the capabilities of the script. He makes the most of the emotional situations and guides his actors with certainty. Photographed by Roger Deakins, this is a beautiful looking film. James Horner’s score is occasionally too emotionally revealing. The image sharpness is rather inconsistent. Mostly penetratingly clear when focused on Denzel Washington, other close-ups are slightly soft. Color is less than perfect as well, with a slight smearing in the darker scenes. The battle scenes are quite exciting, with explosion flashes clean on the dark backgrounds. Fox provides a choice of Dolby Digital 5:1 or DTS Surround. The DTS decoding is outstanding, with pinpoint directionality of bullets and explosions. Dialogue is clear and consistent. Bass extension packs good impact. Packaged as a special edition, Courage Under Fire includes an intelligent and informative audio commentary from director Edward Zwick. A promotional short features clips of the actors talking about their roles and some behind the scenes shots of the filmmaking. It's great to watch grips with shovels providing the swirling dust through which the actors must escape.